Shadow: Being a bad winner. Allowing your achievements to inflate your ego. Looking down on people who seem less capable. Craving to be the center of attention. Giving or receiving insincere praise. Envying the achievements of others. Story: The Main Character scores a small victory, boosting his or her own spirits, but angering the opposition. Relationships. How often do you praise your friend or partner? You may be underestimating how effective a few words of sincere affirmation can be. Recognition doesn’t have to be extravagant; often, all someone needs is a quiet expression of your appreciation. Work. In the rush to get work done, your personal contributions may be celebrated—or overlooked. Recognized or not, your skills have value. If you get a moment in the sun, bask in it. If not, don’t allow yourself to be embittered when others get the recognition you feel you deserved. Spirituality. Offer service quietly, and accept recognition with the same modest spirit. You aren’t working for the recognition, but there’s nothing wrong with allowing others to express the joy they take in the labor you provide. Personal Growth. Ultimately, the opinions of others won’t matter; you must, in the end, please yourself. What standards have you set? To what extent are you meeting them? Recognition is sweet…but meeting or exceeding your own personal criteria for success is even sweeter! Fortune Telling. Someone is planning a party for you, but not everyone feels so good about your recent success. Watch out for envious friends. When? Between August 2nd and August 11th. The Triumphal Procession. The parade depicted on RWS-inspired decks calls to mind the modern “ticker tape parade,” in which heroes roll down boulevards, cheered on by crowds. Does your current level of performance warrant such recognition? Flags, Banners, and Laurels. 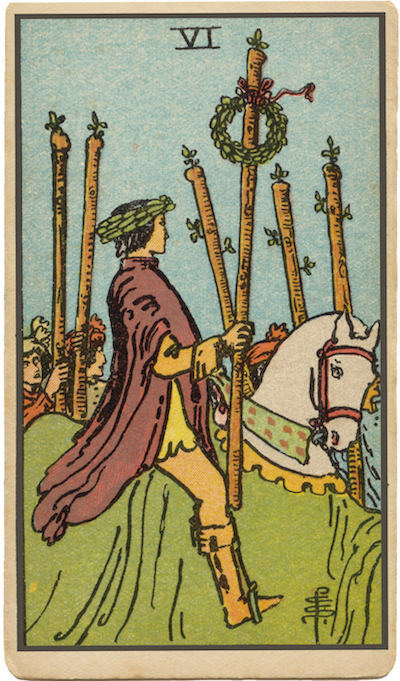 Many illustrations for this card show Wands with flags, banners, and laurels attached. There are many ways to reward victory; what kind of recognition do you crave? When the time comes to recognize the contribution of others, what visual signs of your approval do you offer? Responses to the Victory of Others. When others are victorious, do you lose well? How might this person change her response for the better? How might you change yours? The Marseilles Image. The six Wands are woven together into an intricate lattice. The instability of the Five has given way to the interaction and cooperation of the six. As you strive for personal victory, you’d do well to interlace your efforts this efficiently with the work of others. What kind of recognition do I crave? Why? How freely do I praise the achievements of others? What happens when the parade is over?